Nerds, geeks and spazzes of the world descended on Comic-Con today for panels on the Teenage Mutant Ninja Turtles, Game of Thrones and more Star Wars origami than you could possibly imagine. And that’s just Friday. For those who can’t make it to San Diego, we rounded up some of the best spots around the country (and one in Canada!) to grab a drink, indulge your inner fanboy or -girl and geek out. Here they are, no spoilers. Yes, that is the Tardis. The Way Station is New York’s only Dr. Who–themed bar. According to owner Andy Heidel, the bar’s police telephone box has brought in not just fans, but Steven Moffat himself. Throw back a sonic screwdriver and catch some of the live music they often feature. If you are unfamiliar with the concept of a barcade, we feel bad for you. EightyTwo, in downtown L.A., features arcade games and pinball machines from the past five decades, as well as serious cocktails, like the n00b with vodka, lemon, bee pollen, lemongrass and apple juice. The throwback prices of 25 cents a game don’t hurt either. An all-purpose geek bar, 42 Lounge offers drinks themed around everything from NES to Ghostbusters. You can catch an episode of Cosmos, take in a Cosplay Rave or fight with the person next to you about which Star Trek was the best (just don’t defend Voyager). 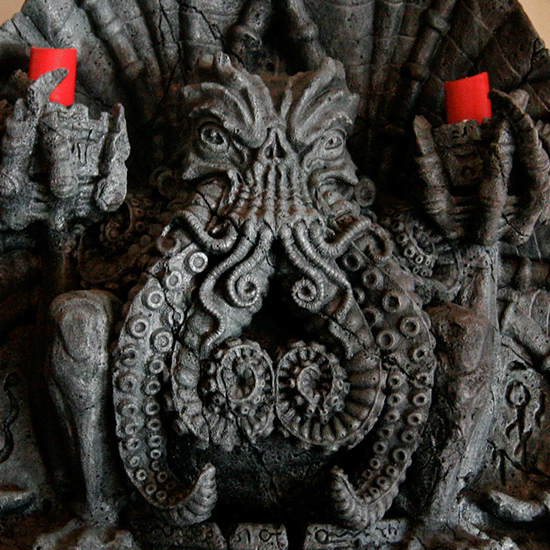 A giant Cthulhu head staring back at you from above the bar is reason enough to stop in. But rolling a 20-sided die to figure out which Game of Thrones– or Fellowship of the Ring–inspired shot you’re going to drink clinches it. The management does politely ask that customers refrain from using battle-axes and crossbows. The bad guys finally get their due at this bar and sandwich shop in Atlanta. Every table is outfitted with villains from Mumm-Ra to Mr. Burns, and every sandwich carries a bad guy’s name. You can also drink up while you’re there, with surprising cocktails like the Texas Chainsaw (bourbon, Dr Pepper syrup, Fernet-Branca and Shiner Bock). Officially opening in September, Geek Bar is doing a July 29 pop-up, where you can sample drinks from Laura Green like the whiskey, earl grey, vanilla bean and flaming marshmallow District 12 pictured above and bar food from Tom Kern like his Gold Coins—fried goat cheese, eggplant purée and chickpeas. The brick-and-mortar bar will be the culmination of last year’s astonishingly successful crowd-funding campaign—it was more than 400 percent funded. In addition to game nights, screenings and comics, the owners plan to engage a whole community of geeks with podcasts and games created by patrons.